The main aim of the NWP SAF AMV (atmospheric motion vector) monitoring site is to improve our understanding of AMV error characteristics in order to enable improvements to the AMV derivation and their treatment in NWP models. Providing a 3-year rolling archive of O-B monthly monitoring plots displaying differences between AMVs (O) and NWP model background winds (B) valid at the same location and time (see Monthly Monitoring tab). 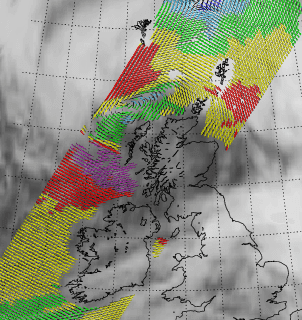 Plots are provided for the Met Office and ECMWF in the same format to enable easy comparisons. Both the AMVs and the model forecast contribute to the differences observed in the plots. Differences between centres suggest model-dependent problems whereas similarities suggest either problems with the AMVs or problems shared by the NWP models. Producing analysis reports every 2 years to coincide with the International Winds Workshops (see Analysis Reports tab). These are detailed studies reviewing (i) the quality of new datasets and (ii) features observed in the O-B monitoring. Details are included of possible causes of the O-B features and, where relevant, actions that may help to alleviate the problems. Carrying out some bespoke investigations e.g. to investigate diurnal error characteristics (see Investigations tab). To provide background information on how AMVs are used in NWP (see NWP tab). As part of this the site hosts information on how AMVs are assimilated at different NWP centres. To provide links for those interested in near real-time monitoring issues (see Real-time Monitoring tab). The main aim of the NWP SAF scatterometer monitoring site is to highlight differences between scatterometer and NWP model estimates of ocean surface wind vectors. This is primarily done by comparing observed wind vectors (O) with model background wind values (B) from a recent short-range forecast. The monitoring is divided in to two parts; near real time (NRT) and monthly. Dedicated NRT monitoring pages are currently available for the ASCAT-A and ASCAT-B scatterometers, as well as the WindSat polarimetric radiometer. The purpose of the monthly monitoring archive is to highlight where there are persistent differences between the observations and the model background and also to show seasonal trends. Past instruments such as OSCAT and ERS-2 are also kept in the archive. This site also hosts information on how scatterometer winds are assimilated at different NWP centres. These details can be found by following the links on the NWP page. You can see which upcoming satellite instruments we plan to add to the winds monitoring on the planned monitoring page.